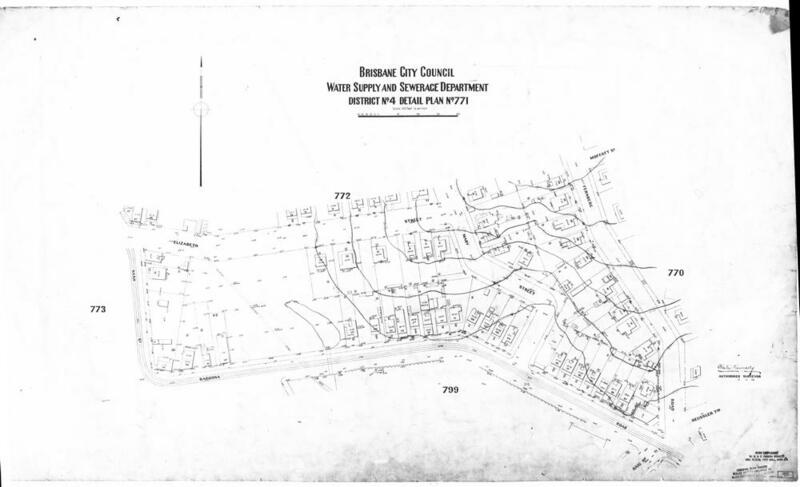 City Council Detail Plans (1930s – 1960s) | There once was a creek . 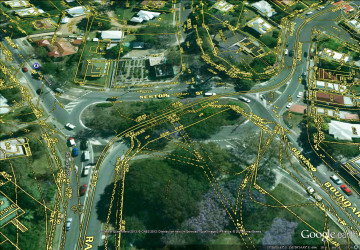 . .
I’ve used a variety of historical maps on this site to explore how the landscape of the Western Creek area has changed. These range from the 1843 plan of Brisbane’s CBD through to A.R. McKellar’s 1895 map of Brisbane and its suburbs. 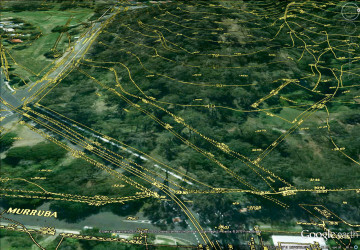 These maps are all at what you might call a ‘suburban’ scale: they cover an area of one or more suburbs and are good for tracking things like the ownership and use of land, the levelling of hills and ridges, the appearance of parks and roads and the disappearance of creeks and other waterbodies. But of course, changes have occurred at a finer spatial scale as well. Houses have been modified and rebuilt; trees have been cleared and planted; gullies have been drained and drains have been covered. 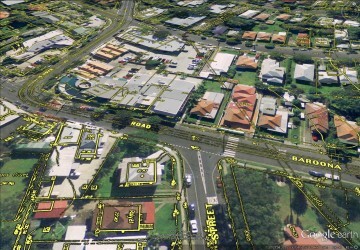 Changes at this scale tend not to be captured by the suburb-scale maps, so we need to look elsewhere to see them. Aerial photographs can show us some of these changes, but the earliest such photographs of Brisbane only go back as far as the 1940s. We can go a little further back in time by examining the ‘Detail Plans’ produced by the Brisbane City Council prior to sewerage being installed in Brisbane. An example of one of these plans is shown below. The earliest of the detail plans cover the CBD area and date from 1911. 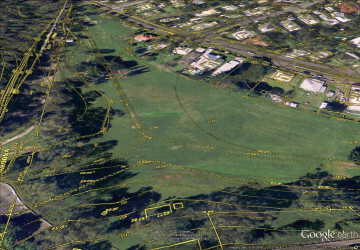 The plans for the Milton and Rosalie areas were done in the 1920s and 1930s. Those in the Rainworth area were done a bit later, with some dated as late as the 1960s. 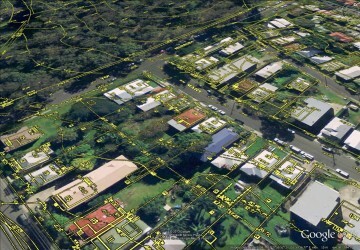 As in the example above, each plan covers no more than a few blocks of houses. A section of plan no. 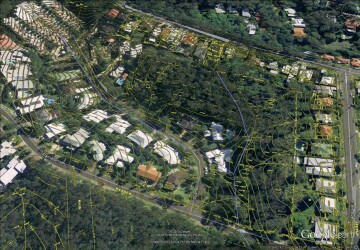 771 (see above) showing details of houses, tram tracks, an embankment and a contour line. 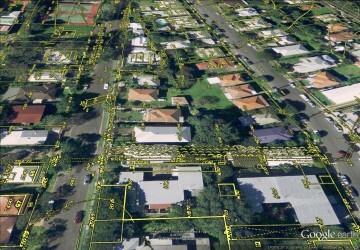 The “Detail Plan” records for Brisbane are an important historical resource especially for researching houses. 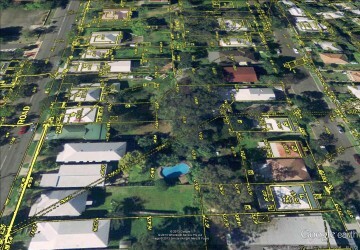 These provide a dated record of the built environment including domestic dwellings of Brisbane suburbs and show the outline of various buildingsincluding land boundaries, fencing, house names and outbuildings. 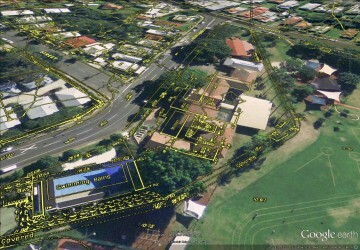 These can include stables, garages; retaining walls, chook sheds; toilets and tennis courts. 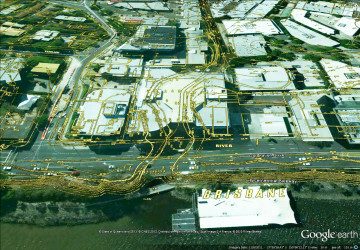 They also show the contour lines for Brisbane City Council Feet Datum. 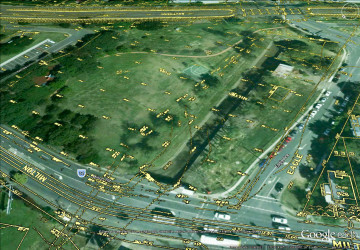 I decided to give some of these plans the same Google Earth treatment as I’d given the other historical maps, and the results are shown in the gallery below. 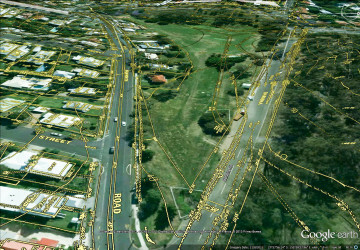 These images are Google Earth screenshots showing overlays of the detail plans along the course of Western Creek, starting from where Milton Drain meets the river and progressing up the catchment to the headwaters below Stuartholme. The images reveal both how much and how little has changed. You can see where open drains have been covered, where houses have been extended or demolished, where new streets have been laid and old ones re-routed. 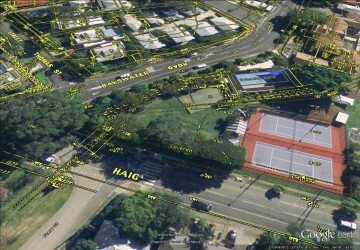 And lots of tennis courts! At the same time, you will find some features in exactly the same place as they are today, such as the swimming pool at Milton School and the cricket pitch at Rainworth School. 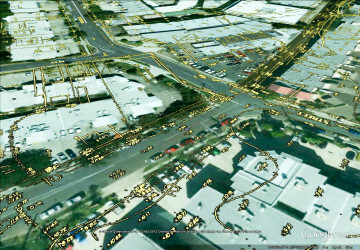 Putting these plans into Google Earth provides a fascinating and engaging way to explore local history at a detailed spatial scale. The more you look, the more you will find. 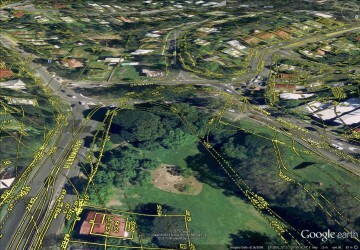 But to get the full experience, you really need to explore them in Google Earth for yourself. 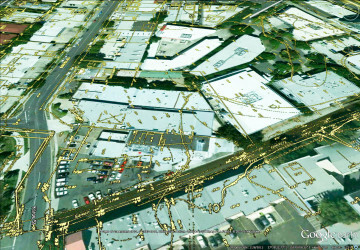 Setting up these plans in an embedded Google Earth viewer (as I did for the other maps) has proven a bit tricky, but you can still explore them in the standalone version of Google Earth by downloading this kmz file. Enjoy! The mouth of Western Creek as depicted on the City Council's 'Detail Plans' from the 1930s. The markings show an open concrete sewer but also the meanders of the original stream. The path of Milton Drain as depicted on the City Council's 'Detail Plans' from the 1930s. The drain is marked as an 'open concrete sewer'. Development either side of the drain is sparse. The path of Milton Drain as depicted on the City Council's 'Detail Plans' from the 1930s. Camford Street is not marked; instead there is a continuation of the open concrete sewer. The building overlapping Douglas Street is marked "Summerland Fruit Preserving Coy". Milton Park as depicted on the City Council's "Detail Plans" from the 1930s. Milton Drain is marked as an open concrete sewer, but along a different alignment to today. Milton Drain as depicted on the City Council's "Detail Plans" from the 1930s. 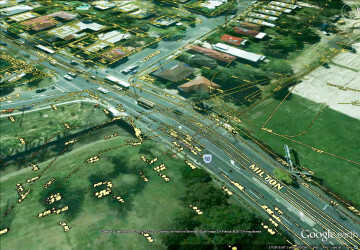 The tram line along Milton Road is also shown. Frew Park as depicted on the City Council's "Detail Plans" from the 1930s. 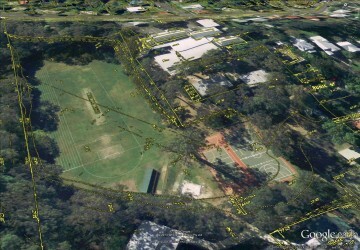 As well as the tennis courts, you can see the open drain stretching across the property. The City Council's 'Detail Plans' from the 1930s, showing the Milton School swimming pool and the drains running past the school and Haig Road. Milton State School as depicted on the City Council's 'Detail Plans' from the 1930s. The main brick building of today had not yet been built. Rosalie Village as depicted on the City Council's 'Detail Plans' from the 1930s. The concrete drain is covered except for a small section near Baroona Road. The tram line is also visible. The covered brick sewer running between Beck and Elizabeth Streets, as depicted on the City Council's 'Detail Plans' from the 1930s. 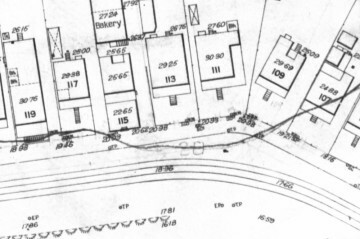 An open concrete sewer running between Beck Street and Fernberg Road, as shown on the City Council's 'Detail Plans' from the 1930s. 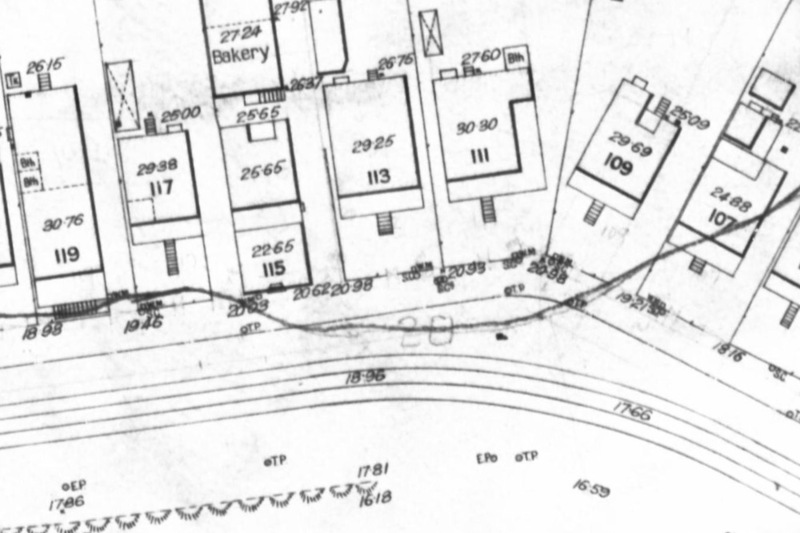 The path of the drain between Mary Street (now Back Street) and Murraba Street as depicted on the City Council's Detail Plans from the 1930s. A bridge on Murraba Street is visible. The drain running through the bottom of the Government House grounds, as depicted on the City Council's 'Detail Plans' from the 1930s. The large ornamental pond was then a plot for cultivation. Norman Buchan Park as depicted on the City Council's 'Detail Plans' from the 1930s. Norman Buchan Park as depicted on the City Council's 'Detail Plans' from the 1930s. The (then) open drain is clearly marked, and the contours show that the cricket field had not yet been leveled. The drain running through the top of Norman Buchan Park, as depicted on the City Council's 'Detail Plans' from the 1930s. The City Council's 'Detail Plans' from the 1940s, showing the drain, tram line and streets before the roundabout was built. 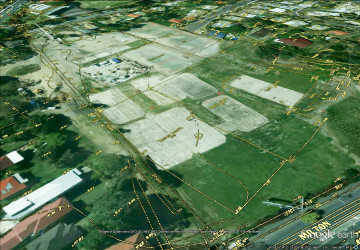 A gully (Western Creek) running around the playing field of Rainworth State School, as shown on the City Council's 'Detail Plains' from the 1940s. A footbridge is marked across the gully in the foreground. 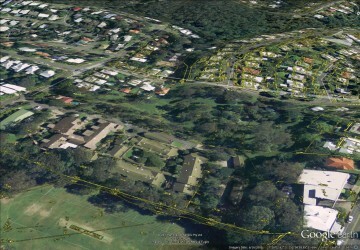 The path of Western Creek from Couldrey Street to Rainworth State School, showing features from the City Council's 'Detail Plans' from the 1940s. 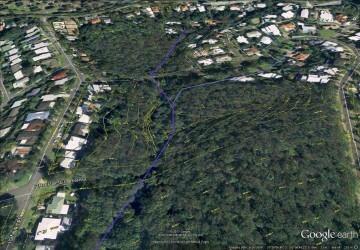 The path of Western Creek through the bushland above Couldrey Street, showing features from the City Council's 'Detail Plans' from the 1940s-1960s. Note the corridors that were reserved for Fifth Avenue and Main Avenue. The path of Western Creek leading up to Birdwood Terrace, showing features from the City Council's 'Detail Plans' from the 1940s-1960s. 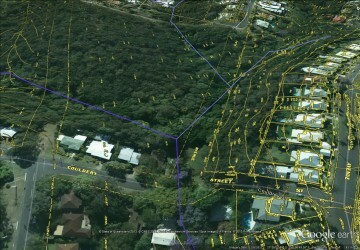 The path of Western Creek above Tristania Drive, showing features from the City Council's 'Detail Plans' from the 1940s-1960s.